Whether you’re an experienced trainer or a frequent presenter looking for a new challenge, please consider being a class instructor at the 2019 WUSS Educational Forum and Conference. Teaching a class is a great way to share your unique blend of knowledge and experience with SAS users. In addition, class instructors receive free conference registration and compensation for their time. Call For Papers And NEW Class Proposals Is Open! 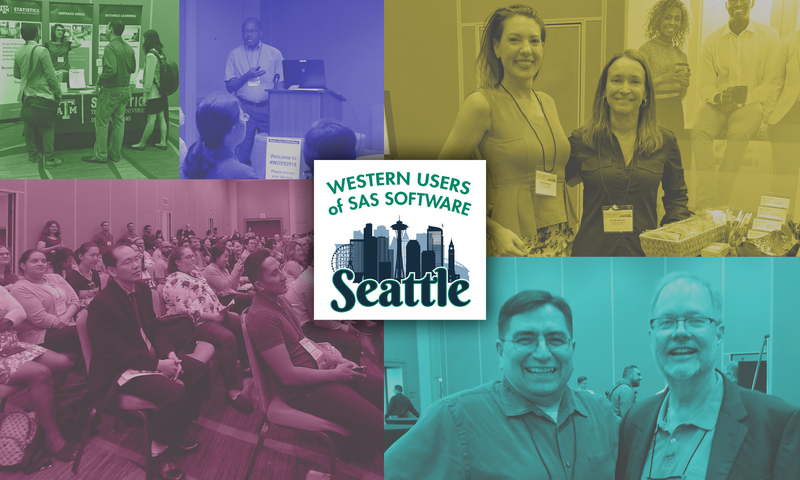 WUSS hosts pre- and post-conference classes on a wide range of topics for all levels of SAS users in a variety of industries. Popular topics have included statistics and analytics, SQL, macros, DATA step programming, reporting and visualization, the Output Delivery System; branching out recently to topics such as data science, text mining, working with Python and R, artificial intelligence and more. If you want some help deciding whether a particular topic is appropriate for WUSS, contact our Class Coordinator for assistance. Additionally, a link to frequently asked questions (and answers) is provided below. afternoon of Friday, September 6th . Most of these classes are offered in a lecture-style format, but there is room for a limited number of hands-on half-day classes. Class proposals are due May 8, 2019. If you have any questions, please email our Class Coordinator. What topics make good classes? Tutorials are always popular, particularly in areas like Macros, SQL, Graphing, ODS, and Report Writing. Statistics also continues to be a huge draw. More recently, data processing with SAS and Python or R, and leveraging SAS for artificial intelligence and machine learning have attracted attention. There’s also interest in classes on unique, hard-to-find topics. Big data, text mining, forecasting, and industry-specific topics are all suggestions that users have offered on the WUSS annual survey, but this certainly is not an exhaustive list. What if another instructor always teaches a class I'd like to teach? One of the things that you’ll find about experienced instructors is that they often offer classes on many topics. The fact that someone else has taught a class on a particular topic shouldn’t discourage you from proposing a class on the same topic. Chances are if you put together a proposal offering a new, shiny class, that will free the other instructor to teach a course on a different topic. Is there a set of popular instructors that most students want to take classes from? Professional instructors aren’t the only ones who can be popular instructors. A well-constructed class on an interesting topic can be a very big draw regardless of who is offering the course. The fact is you don’t have to be a well-known name to be a success. We’re looking for qualified and diverse instructors to add fresh faces to the roster. If you select a topic that appeals to SAS users and take the time to share your knowledge and expertise, you will be a success. I'm concerned that I don't have enough material to fill an entire class. What can I do? Putting together a complete class from scratch can be a time-intensive process. But you may not need to start completely from scratch. Perhaps you have a set of presentations on related topics that can be combined together and expanded to create a Half- or Full-day class. You can also fill some time with exercises and hands-on experiences in the class. Even if your students don’t have access to computers for a true hands-on workshop, there are plenty of effective exercises for students that involve only pencil and paper. For example, you might have students write code by hand and share their samples with each other. Or you might consider a brief Jeopardy-style quiz at the end of each section to enforce what they’ve just learned. These exercises will add some variety to the class structure and will also help enrich the students’ learning experiences in ways that a lecture alone cannot. I'm concerned that I won't make enough money to cover my expenses offering a class. What are my options? That’s a completely valid concern and certainly one that many new instructors share. Full-day instructors receive $150 per registered student and Half-day instructors receive $75 per registered student. You may need to use part of this to cover the costs of class materials and travel costs. Instructors also receive free conference registration. If you’re looking for cost-saving options, one economical (and environmentally friendly) solution is offering digital class materials. If you are planning to provide class notes electronically, they must be provided to students at least one week before the start of WUSS classes. Furthermore, a few hard copies should be made available for those students who may register onsite. All materials, regardless of format, must be offered at no additional charge to students. Can I submit proposals for more than one course? Whether you want to teach more than one course or are just having trouble deciding what to offer, we like having more options to choose from. Just submit a proposal for each class you are considering, and let us know whether you are interested in teaching multiple classes. My class isn't SAS-specific, but may be of interest to SAS users. What should I do? SAS users come from a variety of industries and occupations. The topics that interest our users are diverse, including statistics, data analytics, report writing, data visualization, and so on. In addition, there is a significant interest in topics that are industry specific. The entire course does not have to be a SAS tutorial, but it should offer a fair amount of SAS-specific examples and code that users can try out at home. Can I talk about other software besides SAS? Examples and code from other software can be shown alongside SAS code. However, SAS should remain a primary focal point of all examples and code. What does WUSS provide to me as an instructor and what do I need to bring myself? WUSS will take care of registering and processing payments for all students. WUSS will also supply a classroom and A/V equipment (including a projector and screen). WUSS provides catering for the students and instructors, which includes a continental breakfast for morning classes, a light lunch for afternoon classes, and continental breakfast and light lunch for full-day classes. Instructors should bring their own laptop. If an instructor owns a projector and is willing to use it, then WUSS appreciates the savings on AV expense. Instructors are also expected to provide a complimentary copy of the textbook or class notes for each student in the class in hard copy or electronic form. If digital copies are to be provided in lieu of hard copies, they must be provided to students at least one week before the start of conference classes. Additional hard copies must also be made available in case students register onsite. Please note that WUSS is potentially exploring “Bring Your Own Device” and there may or may not be devices available onsite. If you are planning a Hands-On Workshop, please make sure that your class is suitable for SAS University Edition and it is installed on your device. We will give instructors and attendees advanced notice if we determine we will not have devices available onsite. Are instructors expected to attend the conference? Instructors are expected to attend and participate in the conference, and are required to provide a 50-minute presentation or Hands-On Workshop during the conference. (The topic of the presentation does not have to be the same as the class being taught.) We welcome the involvement of instructors in other ways, such as volunteering to be a Section Chair, Session Coordinator, or Mentor. Can I offer my free conference registration to someone else? The free conference registration offered to class instructors is not transferable. If a class is taught by more than one instructor, free registration may be offered to each instructor at the discretion of the Conference Chairs. Do my class materials have to be in any particular format? Instructors are free to use any format they choose for their presentation and class materials. If you would like to use the WUSS paper and PowerPoint templates, they can be found in Presenter Resources. Can I submit more than one class proposal? You can submit more than one class proposal. If you have multiple classes, please add a new submission for each individual class proposal in the submission system.